Phi Beta Sigma Fraternity, Inc. was founded at Howard University in Washington, D.C. on January 9, 1914 by three daring, young black students. The Founders, Most Honorable A. Langston Taylor, Most Honorable Leonard F. Morse, and Most Honorable Charles I. Brown, wanted to organize a Greek letter fraternity that would truly exemplify the ideas of Brotherhood, Scholarship, and Service.The Founders deeply wished to create an organization that viewed itself as a part of the general community rather than apart from it. They believed that individuals should be judged on their own merits rather that their family background, without regard of race, nationality, color, skin tone, or hair texture. They wanted their fraternity to exist as a part of an even greater brotherhood which would be devoted to the "inclusive we" rather than the "exclusive we". 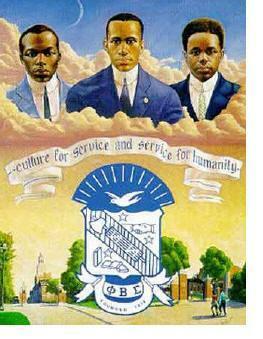 From the beginning, the founders conceived Phi Beta Sigma as a mechanism to deliver services to the greater community. Rather than gaining skills to be utilized exclusively for themselves and their immediate families, the founders of Phi Beta Sigma held the deep conviction that they should return to their newly acquired skills to the community from which they had come. This deep conviction was mirrored in our fraternity motto, "Culture for Service and Service for Humanity". From its inception, the founders also conceived Phi Beta Sigma as a mechanism to deliver services to the general community. Rather than gaining skills to be utilized exclusively for themselves and their immediate families, the founders of Phi Beta Sigma held the deep conviction that they should return their newly acquired skills to the communities from which they had come. This deep conviction was mirrored in the fraternity motto, "Culture For Service and Service For Humanity." Today, more than three-quarters of a century later, Phi Beta Sigma has blossomed into an international organization of leaders. No longer a single entity, the fraternity has now established the Phi Beta Sigma Educational Foundation, Inc. and the Phi Beta Sigma Federal Credit Union (to build financial equity within our target communities). 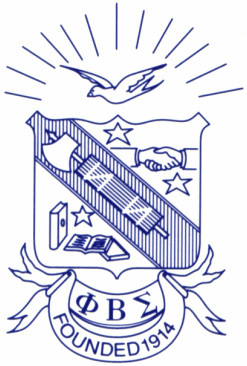 With the force, vigor, power and energy of its more than 100,000 dedicated men united in more than 700 chapters across the United States, Africa, Europe, Asia and the Caribbean, Phi Beta Sigma continues to faithfully perpetuate composite growth and progress as the "people's fraternity" dedicated to providing services to all humanity. One of the three founders of Phi Beta Sigma Fraternity, Inc., was born in Memphis, Tennessee. He graduated from the Howe Institute in 1909 which is now Lemoyne-Owen College in Memphis. He received his college and professional training at Howard and Frelinghuysen University in Washington, D.C. Founder Taylor chose business for his life's career and from 1917 to 1926 he conducted a real estate and insurance business. For he was the Secretary-Treasurer of the Potomac Investment Company, Director of the Federal Life Insurance Company and President of the Taylor Tobacco Company. Founder Taylor coined "Culture for Service, Service for Humanity". He began serving Humanity by the founding of Sigma, to which he gave twelve consecutive years of service as a National Officer, serving as National President, National Treasurer, National Secretary, and Field Secretary. He also served as President of the Distinguished Service Chapter. Brothers have described our Founder as distinguished, poised, and truly a hard worker. The members of Alpha Sigma Chapter called Founder Taylor "Prof" short for professor, because he was always carrying a book, files, or reading. He was instrumental and held offices in the following organizations; The Washington Art Society, The Derby Club, The Banneker Research Society, The Mu-So-Lit Club, and the Tennessee State Club. Founder Taylor is buried at Lincoln Memorial Cemetery in Suit land, Maryland (right outside of Washington, DC). His grave-site sits at the highest peak. Founder Morse trained in the elementary and secondary schools of New Bedford, Massachusetts, he became the valedictorian of his integrated high school and entered Howard University. In 1915, he graduated from Howard University and was the first person to graduate in 3 years with an A.B and B.Ed degrees. Later, the degree of Bachelor of Divinity was conferred upon him by the Payne School of Divinity, Wilberforce University. He received his Master's degree from Northwestern University, Evanston, Illinois and the degrees of Doctor of Metaphysics and the Doctor of Psychology from the College of Metaphysics, Indianapolis, Indiana. The Honorary Degree of D.D. was conferred at Allen University, Columbia, SC, and the LLD at Edward Waters College, Jacksonville, FL. Founder Morse was a student of the Greek language and he named our beloved fraternity. 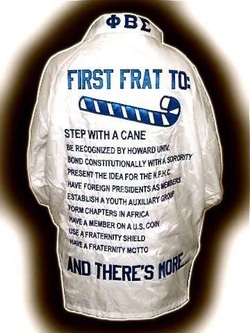 In addition, he wrote Sigma's first constitution and was the first president of Alpha Chapter. In the 1915 Howard University Yearbook, entitled "The Mirror", Founder Morse has listed by his name the following: Director of Social Service, YMCA, 1913-1914. Organizer and President of Phi Beta Sigma, 1914-15. President, Young Men's Progressive Club, 1914-15, tutor of languages and history. In the 1915 Howard University Yearbook, Founder Morse left us with "Smooth Runs The Water Where the Brook is Deep." in 1924, in which Founder Brown indicated that he was teaching in Kansas. I) First to have Presidents of other countries in its membership (Bros. Kwame Nkrumah, Dr. Nnamdi Azikiwe, and Nelson Mandela). V) First to establish a chapter South of the State of Virginia before the year 1915. XV) Lastly, many Fraternities may have supported the Million-Man March, but only PHI BETA SIGMA FRATERNITY, INCORPORATED can lay claim to not only supporting, but also sponsoring the March in its International Headquarters.